A canteen is a drink container designed for use by campers, hikers, and workers in the field. They are used to carry supplies of drinking water, and are made in various sorts of styles and with various materals. A leather canteen–also called a bota bag or wineskin–is a traditional Spanish liquid container. Traditionally, they were lined with tree sap or other resins in order to prevent liquids from seeping through, though modern bota bags have a plastic liner and a nozzle. 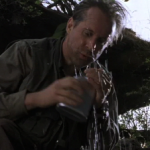 Some of the InGen Hunters drank from wineskins during their trek across Isla Sorna. Hip flasks are traditionally made of pewter, silver, and even glass, though most modern ones are made from stainless steel; the term “flask” also applies to the smallest bottle sizes of commercial alcohol. Hip flasks are usually purchased and then filled by the owner. Some flasks come with small cups so that the drink can be shared, though the liquid is usually drank directly from the flask. 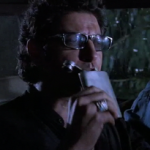 Ian Malcolm owns a hip flask and took it with him to Isla Nublar, at one time offering a swig to Alan Grant. During the conversation between the Hunters and Gatherers on Isla Sorna, Peter Ludlow also was seen using a hip flask. Blanket-covered canteens are usually made of metal, and its sides are covered with a wool-type materials, generally with a striped pattern. A screw-on cap allows it to be opened and closed easily, and a strap lets the user carry it within easy access outside of their other equipment. 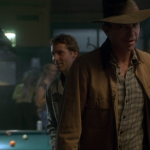 Some of the InGen Hunter used blanket-covered canteens during their trek across Sorna. 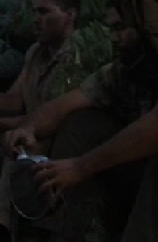 Another type of canteen is standard issue by the US Military, either made of metal or plastic. A specially made container is designed to wear the canteen on the belt. 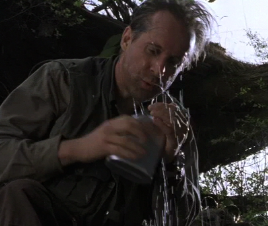 Dieter Stark can be seen using this type of canteen a few times while on Isla Sorna.